Let’s help the council make some money! I spent years trying to persuade my company to set up an ideas and suggestions system. Ten years ago there was a one room office, and I could send ideas to my boss. He would always look at my random suggestions (and he must have been fed up with getting them) but a few ideas did get implemented. Then the years passed and the company grew and grew… My boss was busy managing six offices full of people, and my line manager only liked ideas about our department. There was nowhere for general ‘this might work’ ideas. This drove me nuts! Ideas are free, everyone has them, they can be bad, indifferent, good or amazing… And do you know the best way to find a good idea? Have lots of ideas! Ideas are powerful, ideas are my favourite thing, and a good idea can change the world! So I was happy when my company finally set up ‘The Innovation Hub,’ an online place to harness the free resource of their thousands of idea-generating staff. I was even more thrilled when they realised how useful it was and invested millions in innovation. So what’s all this got to do with the council? Well a small post on a Facebook page just got me really excited. The post used my favourite word ideas! Canterbury City Council (yes, a council!) have this thing called ‘Ideas Lab.’ It’s a workshop in January for people to help the council with income generating ideas. The document detailing this starts with the problem to fix – and it’s a big one. That s pretty sensible. So, how? So, the council has told us about a problem. I like honesty… They’ve said what they’re doing. Good…. And they’re open to offers of help. I like this best, because we are all in this together. We need important council services supported, and so of course I am willing to help. Ideas to generate income are needed because these days councils can set up any money making enterprise. The Ideas Lab will showcase ideas that other councils have used, and from what I’ve heard about all this there are some clever, and responsible, enterprises out there. There is no reason why the council couldn’t generate income and also improve tourism, or generate income by adding features to services they already operate. So, this is Canterbury Council realising that ordinary people might care to get involved. I don’t have any amazing ideas yet, but I’ll try to think of some. Even if the ideas people come up with aren’t much good I still think people will appreciate being involved in this way. It took ten years to get the Innovation Hub set up at work, it’s taken this new council just six months to realise that ideas matter. I read about the Ideas Lab on the excellent Campaign for Democracy in Canterbury District facebook page. If you’re interested in participating contact Haroon Awan on haroon.awan@canterbury.gov.uk. I believe there will also be ways to participate online. I hope some bright ideas get found and we can help the council make some much needed cash. *That might just be me. It’s worrying times for Community College Whitstable, their head suspended, disappointing GCSE results, and a ‘Requires Improvement’ Ofsted. I’ve spoken about the problems in Kent’s non-selective secondary schools before. My daughter went to Chaucer Technology School, but we were unhappy with the school and moved her just before it went into special measures. She’s now landed in yet another troubled school. Today I volunteered for a mentoring program that works with children at the school. I’ve been interested in working with secondary school children for a while, I’ve even considered being a teacher but I don’t think I’m quite cut out for that. I like the kind of education that encourages a love of learning. I hope a mentoring program will be more about individual children than lots of classroom facts. I also have a love of games and community events. I set up the Museum of Fun partly because it lets me create interesting stuff. It shouldn’t really tie into secondary schools, but with the way my mind works it does. Do you know about escape games? They lock a bunch of people in a space and there’s a time element, you have to solve the clues to get out. There’s a big new one based on the Crystal Maze coming to London soon. So how do escape games, community events, and a failing school fit together? Well I’d love to create an escape game for Museum of Fun. I was thinking of a Whitstable venue, and think the best one would be Community College Whitstable. So I had the mad idea of creating an ‘Escape from School’ game. Perhaps the story is that an evil teacher has locked people in the school, and people playing the game need to solve clues based on science, history, or maths puzzles..? Plus it could have people dressed up as zombies. Everyone loves zombies! I will see how it goes with the mentor program first. I am a very amateur school helper, plus kids these days haven’t even heard of the Crystal Maze. I just learned that Herne Bay has council funded reindeer. Each area of Canterbury City Council has an Area Member Panel (AMP) Opportunity Fund. This allows councillors to give small grants to groups and individuals who come up with a plan to help their community or improve their town. So someone in Herne Bay applied to the Herne Bay councillors to put reindeer at the end of the pier for Christmas. I think this is a mad, but lovely idea! It will give children in Herne Bay far more pleasure than the regular lights and tree. In fact I know I’ll be visiting Herne Bay with my kids to meet those pier reindeer. Two years ago I applied to Whitstable councillors and received a grant from the WAMP opportunities fund. I wanted to put on a community event, I had plenty of ideas, a few people who would help, but no money. The councillors said yes and this meant the Museum of Fun was born. I had never applied for a grant before in my life, but this was a simple one page application, and the councillors understand what I was attempting to do. So, if you live in Whitstable and have a seed of an idea I would urge you to put in an application to the Opportunity Fund. It is a perfect opportunity for a few friends to get together and try to make a small difference. Maybe a Mums group needs new toys for its members? Or a street want to get together and create a shared vegetable garden? Or a group would like to put on a free show for their community..? There are very few rules and you can apply for as little as £50. I’m sure the councillors would welcome new faces applying, and appreciate people who haven’t been much involved with community things applying for cash to try to start something up. In its first year Museum of Fun was funded by WAMP, in its second year it was funded entirely by sponsorship and fundraisers. More that 50 amazing volunteers got involved to create a great event for our town. I will always be grateful to WAMP for getting this project off the ground, it’s grown into something I’m very proud of. You can find the very simple WAMP application here, I’d be happy to advise if anyone has questions, or needs help filling in the form, just email whitstablemuseumoffun@gmail.com. Spread the word, because I know Whitstable people are creative and care about their town. Herne Bay has council funded reindeer, so what can Whitstable do?! Since I started working on Museum of Fun I’ve come across a heap of amazing people who are keen to get involved, or are busy working on their own ways to take action and make Whitstable a better place. I’ve discovered this undercover world of active citizens running groups and societies with no plan to make a profit, from the board game club, to the Twinning Association, to the lantern parade, to park run, residents groups, the museum community group or WhitLit volunteers. There are far too many to list, in fact there’s a small army of people who are giving time, energy and thought to adding a layer of interest and depth to our town. I don’t know if there’s a phrase for these people. I wish there was. I think of them as the Active Citizens of Whitstable. Although that shortens to ACOW which isn’t a very friendly acronym. And citizen reminds me of Citizen Smith, so I’m not sure the word is right. I have a few dreams about my life in this town. One of them is to throw an annual party for all the ACOWs (name to be confirmed.) To get an invite you must pledge to take action and do some positive act to improve life for our community. It could be one small thing like volunteering to go on a beach clean, or taking in interest in local affairs by attending a WAMP meeting, or setting up a group for your hobby. I like the idea of this meeting for people who Do Stuff, and wonder if new ideas could be hatched, alliances formed, or maybe this meeting of busy creative people might even have some epiphany and win the Holy Grail of Whitstable life and fix our traffic problems? It’s a shame that Whitstable has one big unsolvable issue that can never be fixed. The town’s traffic problems inspire opinion and debate, but there is no easy answer, there’s just too many cars and it’s impossible to fit them neatly into place. 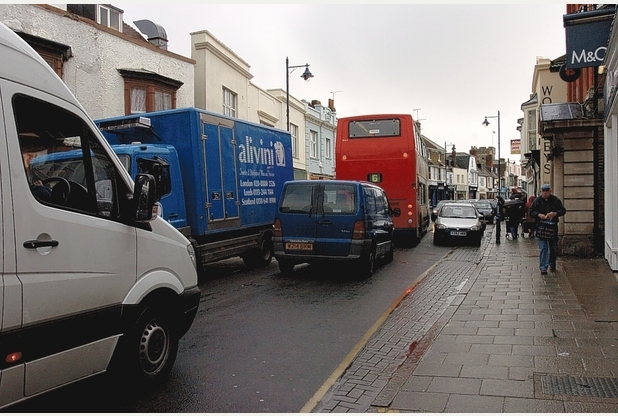 I’ve only been to two Whitstable Area Member Panel meetings but parking issues have dominated both. We can add yellow lines, take away yellow lines, change rules with loading bays, get tougher traffic wardens, or spend money on consultations, but nothing can fix the problem of a town that’s too small to hold all its cars. The traffic problem will feature at these meetings until flying cars park in the sky. WAMP is a council meeting for and about Whitstable. I fear the average Whitstable citizen couldn’t tell you the difference between Canterbury City Council, Kent City Council, and the work our MP does. I’ve learned a lot since my husband got elected as a councillor. I’ve come to the conclusion that Canterbury Council is 40% council staff telling councillors what to do, 30% bins, 20% transport, 10% development and planning and 10% wearing robes in parades. I expect my husband has a better understand of it all, and can even make the percentages add up. I am finding it fascinating to learn about local government, and am glad I now understand that white gloves and tie must be worn with the robes, and that cathedral invites traditionally entitle wives to sit a few rows from the front with a good view of the robed backs. WAMP involves all our Whitstable councillors, and before my husband was a councillor I had the vague idea that it was a meeting to talk about the bins. I was wrong, it’s all about the traffic. The councillors also hold a £15,000 pot of money for useful projects for the town. My initial interest in WAMP was entirely based on the idea that they might give me £750 to put on a free community event. The councillors said yes, so I am very grateful that WAMP helped launch Museum of Fun. 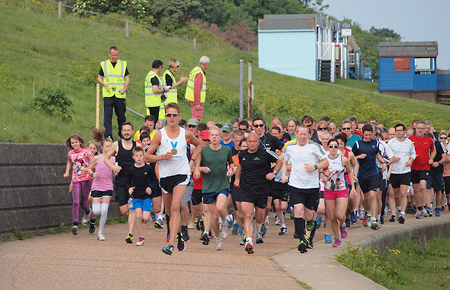 This year we’re doing it again, bigger and better and with money raised entirely from fundraising and sponsorship. WAMP got us off the ground and I appreciate receiving their seed funding. I heard about the money from someone who’d applied in the past, and I think the regular community folks do know about the WAMP grants. But this cash is for anyone who has a good plan that benefits people in the town. We weren’t an official group when we applied, just a few friends with a mission. You can ask for a few hundred pounds, and there’s even an easy application form. I hope someone reading this might have a good idea and apply. WAMP is not a secret, but just like no one really knows what the council does, no one knows that every six weeks a public meeting takes place where anyone can raise a question and get involved. I think it’s great that anyone can potentially email a discussion point and might get councillors to investigate their Car Park In The Sky idea. You’d have to be the sort of person who enjoys reading the council website to know about WAMP, so the same regulars tend to go each time. People who organise community groups, individuals with a passion for double yellow lines, or more often, political types who find it their only opportunity to voice their opposition to everything tory. Half the local voters voted for opposition parties, but eight of nine councillors are Conservative. I have to admit it makes perfect democratic sense to give people their say this way, I just don’t like that it leads to shouting. I am a big fan of community involvement, I’ve even read the Localism Act 2011 (plain English version, it’s very readable!) which is a significant law about good people making a difference. An open meeting for councillors and the people to come together is an excellent thing. The problem is the practicalities of making this work. 1) The community are more interested in Game of Thrones than ways to make our town better. 2) The community who do care about their town are not likely to come to an obscure meeting that sounds like a yeti. 3) The left wing people who care understandably have a bit of a chip on their shoulder and engage councillors in a shouty ‘us and them’ battle. I went to the last meeting because I was interested in hearing views on a local issue. It became awkward because my councillor husband was elected chairman of WAMP. His first job was to field a question from me, and declare himself unable to answer because he knows me. He knows me very well. The problem is neither of us know exactly what to do about sharing an interest in local things. He needs to learn what to do as a Councillor, and I need to learn what not to do as a Councillor’s Wife. And the good thing is I can leave him to sort all three points above. My Councillor husband is doing a great job, you can read his blog here if you like. I’m not sure if there’ll be any quick changes to WAMP, whether he’ll add an agenda item about Game of Thrones to popularise the meeting, or lower the volume on the shouty opposition, or even lead Whitstable to victory in the parking war. I only know he’ll do his best, which is probably all you can do with this complicated monster of a meeting. I do like WAMP, but I’m glad I have the chance of more practical community stuff to get involved with. It’s a lot easier creating a community event than fixing impossible issues with cars and buses. The next WAMP is September 9th, do go along but please don’t expect an answer to traffic issues, and I’d appreciate it if you could make political points at normal volume, thanks.